The Thule Society, a dark Nazi cult dedicated to furthering the esoteric knowledge that fuels the ever growing Third Reich, may have acquired the ancient Heart of Yhtill and all the power it promises. Worse still, they appear to have partnered with malevolent aliens known as the People of the Worm, who seek to ensure that World War II devastates the entire planet, leaving humankind ripe for conquest and consumption. 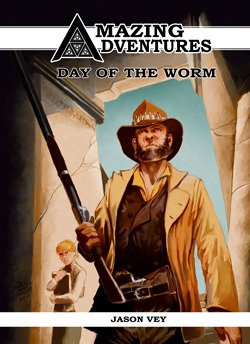 The PCs, working with the Allied forces, and alongside fanatical Ormazd Society allies, find themselves in a race against time to stop the People of the Worm from unleashing a doomsday device from within a hidden tomb in Egypt's Valley of the Kings. If only the Nazis and the People of the Worm were their only worries: there is another, equally mysterious force who want the Heart of Yhtill for their own alien agenda.